DHS Class of 1964 to celebrate its 55th Class reunion! Ok guys, it's time to make your plans for DHS Class of 1964 to celebrate its 55th Class reunion! We have sent notices earlier so that you can start making plans to attend this summer. The attached invitation gives you all the information in regards to our agenda to celebrate this special time together. We hope that each of you will make an extra effort to be here if able. We've planned a great weekend for all to enjoy and fellowship with old friends that we hope we recognize!! Many years have passed for each of us and it's a blessing to be able to get together and bring back old memories, as well as, talk about our grand-kids. Please let us know as soon as possible whether you will be able to attend and the number in your party, so we can plan accordingly with the Dothan Country Club. $30 per individual per night. $120.00 per couple for both nights. 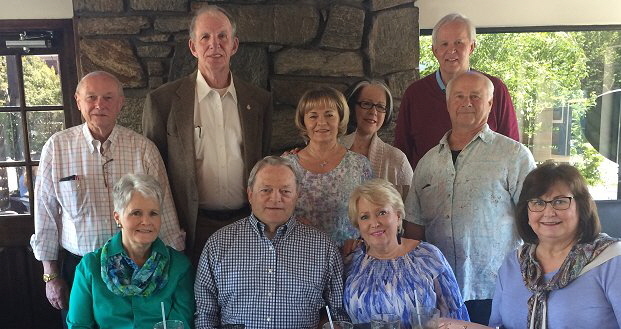 Atlanta DHS64 Classmates Meet in Buckhead, Georgia! Great meeting and Lunch at Mirko’s Restaurant, Atlanta. Bill Floyd, Michael Behrman, Jean ONeal Veale. 2017 reunion pictures are now online. Click to view 2017 Reunion Pictures. Our multi class reunion on April 29, 2017 was a blast with great fun for all attending. Everyone looked great and all appeared in good health and humor. Saturday, April 29 from 6:30 pm to 11 pm at Landmark Park. Each class facilitator 1959 - 1964 was responsible for communicating the event to include mailing address for their classmates. Jerry Seagars hosted the classes of '63 & '64 Friday night, April 28th, at his home beginning at 6:30 - 11:00 PM. Karaoke, Great oysters, and Bar B Que was enjoyed by all. Thanks, Jerry! Our 50th Reunion Was Great! The 50th. Class reunion was held August 1-2, 2014, at the Dothan Country Club. Friday night was a heavy hors'd oeuvres and a cash bar. Saturday night was a buffet and cash bar. The price for both nights for a single was $60.00 and for a couple, the cost was $120.00. For what we got this was a great price. If you attended you know it was fun and as usual classy. If you did not attend, you missed a lifetime special event and were missed. The Strangers played 60’s music for us on Saturday night, Dancing and memories were shared by everyone and we felt like one big happy family. The reunion T shirt is superb. It shows a replica of the '64 Gargoyle cover. Jerald Vinson held lunch for us at his place for Saturday. Some pictures have been posted, prior to receiving the official photos. ...it was a memorable event! Time is passing quickly as we all get older. Remember, childhood friends are lifelong friends. Let's all make a conscientious effort to keep in touch and get together. Many of the email addresses we used for the last reunion are no longer valid. So please keep these and physical addresses up to date so we can stay in touch with you. Stay healthy and happy! or mail to 935 Keaton Pkwy, Ocoee FL 34761. Dothan High School Class of 1964 held its 40th reunion on August 13-14, 2004. It was an outstanding success. If you missed this one, images and details remain posted here for your enjoyment. There is a lot happening in this classy group of friends and you are invited to add to the online content. Join us right now. Whether you need to find an old classmate, or share some good memories, we have captured a lot here. At Dothan High School Class of 1964, our goal is to keep track of you and provide a way to keep in touch. Be sure to fill in the survey information web form updating your personal information for Reunion 45. Browse this site for information about Dothan High School Class of 1964. Search for names using the search bar. If you have questions or would like to speak with your Class representative, please contact us. Reunion 2017 pictures are now online. Click to view 2017 Reunion Pictures. Reunion Fifty pictures are now online. Click to view 50th Reunion Picture Gallery. Reunion Forty-Five are also online. Click to view 45th Reunion Picture Gallery. Reunion Forty pictures remain online. Click to view 40th Reunion Picture Gallery. Did you know that you can view our 1964 yearbook on line?